Made at the Brandeston Forge, the sign was dedicated in 1987 in memory of local resident Ken Haslam with each quarter representing an element of local life while the sign’s supports are indicative of the reeds commonly seen around the River Alde. The ship represents the Anglo-Saxon burial grounds on the Aldeburgh Road, the monk commemorates the Benedictine Order at the former priory under Chapel Fields, bottom left shows the bridge that was demolished in 1960 and the curlew symbolises the inspiration that Benjamin Britten took from the riverside environment. 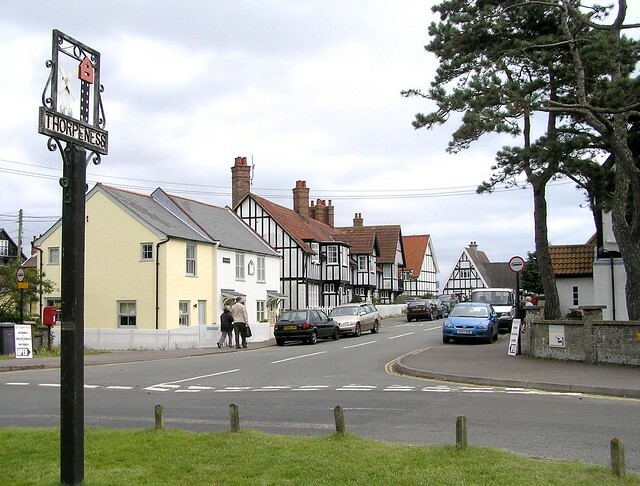 The sign belonging to this popular coastal village made national news in 2012 when it resurfaced following a theft in 1984. 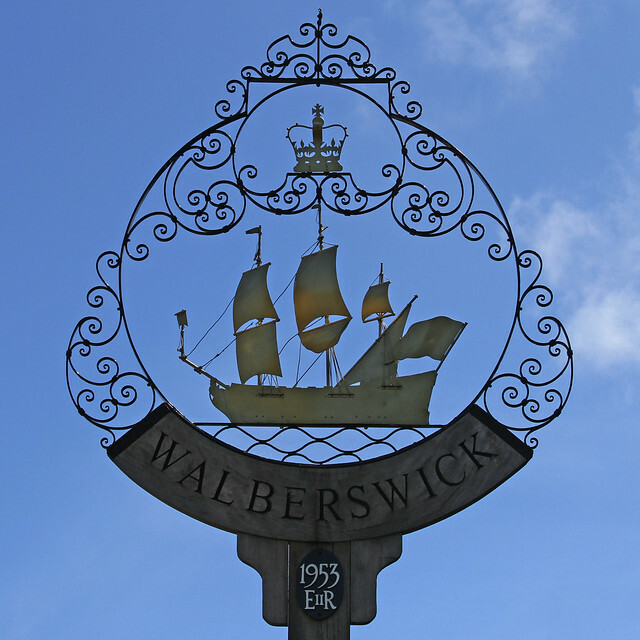 Despite a slightly smaller replacement being placed on the Green, the original was welcomed back into the village when it was donated by a Kent couple who had purchased it in the mid 1990s without knowing Walberswick even existed. Featuring the locally-made HMS Basing at its centre - which took part in the Battle of Lowestoft in 1665 - the sign was designed by local architect Clifford Russell to celebrate the coronation of Queen Elizabeth II in 1953. The star of this sign is Saint Clare, founder of the Order of the Poor Ladies which was later renamed the Poor Clares following her death. The order had an abbey - which was previously the Rokes Hall manor house - in the Suffolk Coastal village until the Dissolution of the Monasteries under Henry VIII. Today the hotel and wedding venue Bruisyard Hall stands on the site and uses some elements of the original building. The design of this one is pretty minimalist with two of Thorpeness’ iconic buildings being the only notable features in its relatively simple design. The House in the Clouds - a cladded water tower that’s available to book as a holiday let - and the windmill are two central parts of the village’s unusual past where one man almost single handedly transformed the former fishing hamlet into one of the country’s most distinctive holiday havens. 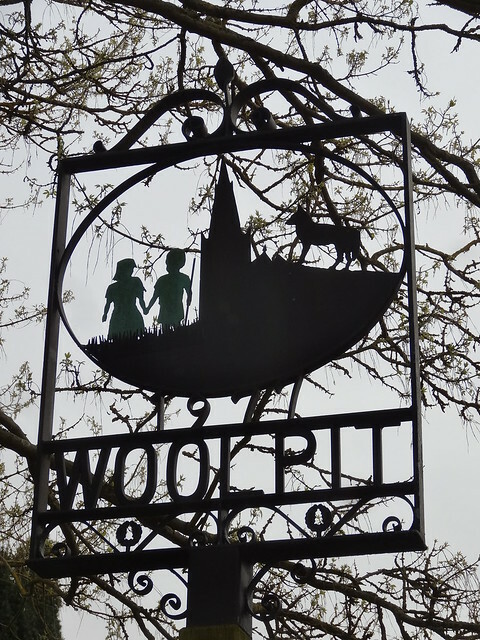 Two of Suffolk’s oddest pieces of history and folklore are captured within this sign which stands near Woolpit’s St Mary’s Church. The wolf signifies the area’s original 10th century name of Wlfpeta, meaning ‘pit for trapping wolves’ in Old English. On the other side of the church the two children represent the locally-known ‘Green Children’ legend where two green-coloured children mysteriously appeared in the village speaking an unknown language. 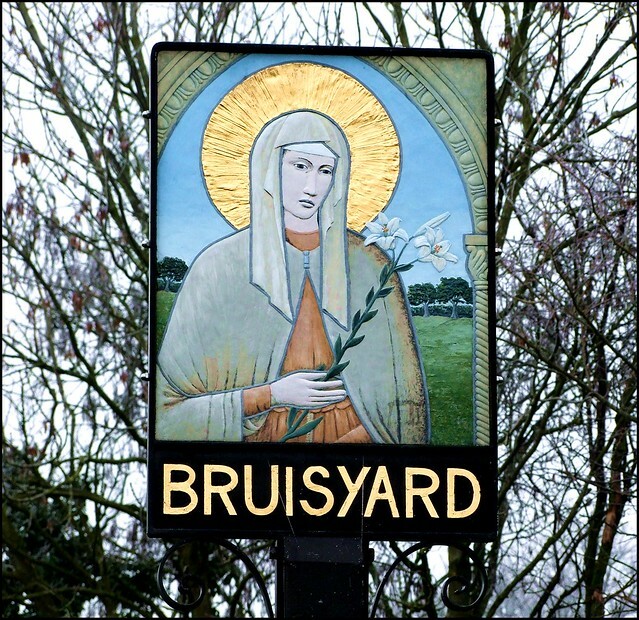 In the late Anglo-Saxon period this Mid Suffolk village became known for the 55-mile pilgrimage to Bury St Edmunds where the county’s religious folk would travel to honour King Edmund after his death. 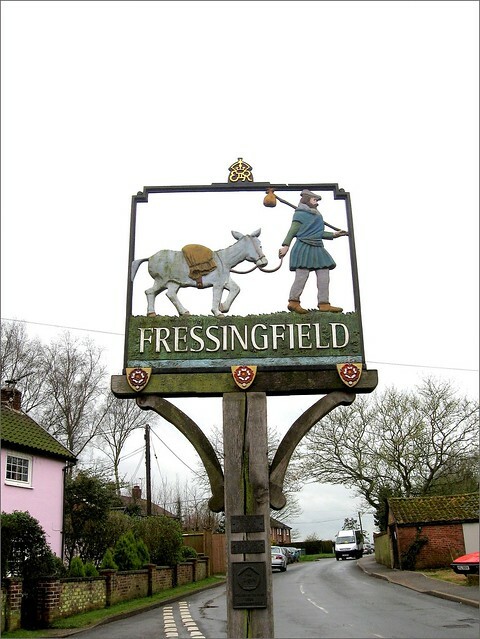 This pilgrimage is depicted in Fressingfield’s village sign where a pilgrim has his pack mule in tow. The sign was appropriately erected on Jubilee Corner in 1953 to mark the queen’s coronation. 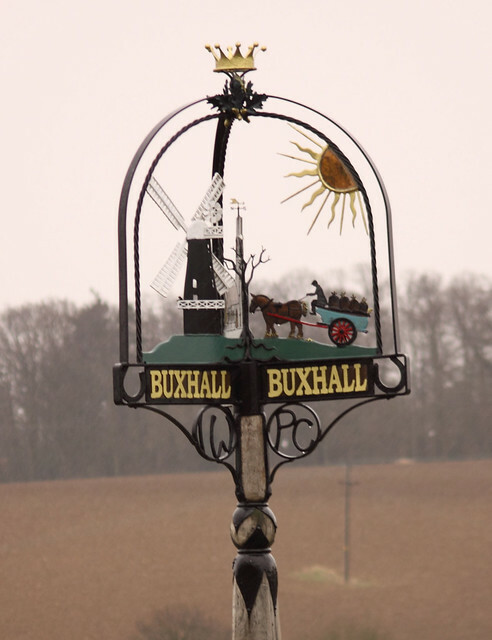 As we moved into the millennium nearly two decades ago many of Suffolk’s villages received new signs and Buxhall’s three-sided example is one of the most intriguing. The area’s agricultural heritage is symbolised up the pole and onto the main feature where a horse-drawn cart stands next to the old mill - which still stands today yet without its sails - and the Norman St Mary’s Church. With the right angle you can admire the sign at the same time as the unusual spire of St Andrew’s Church in the distance. 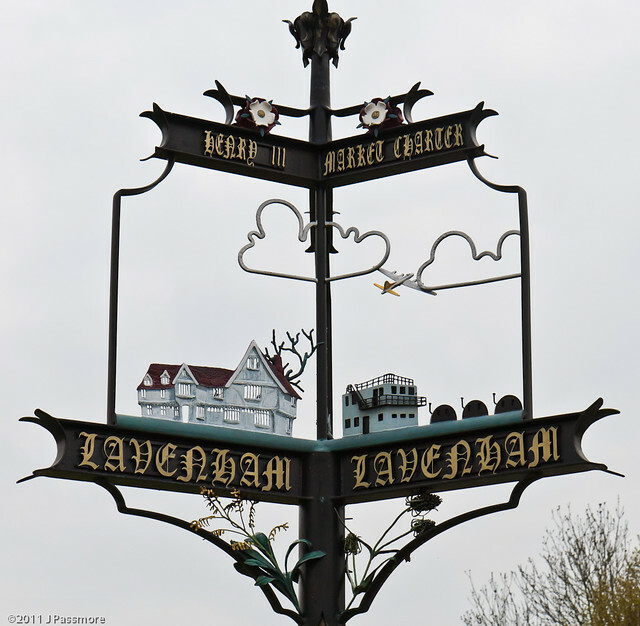 Medieval Lavenham is lucky enough to have two village signs yet it is the more ornate example pictured below that will most likely draw the eye of photographers. Using a three-sided design similar to Buxhall, you’ll instantly recognise the Guildhall and the Church of St Peter and St Paul while the depiction of a WWII American airbase on the final third may be slightly more obscure to those visiting the area. 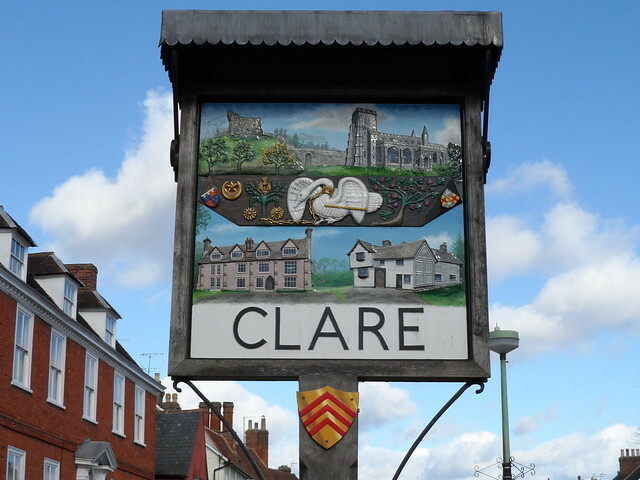 With approximately 185 protected or listed buildings, monuments, businesses or domiciles within the town, it’s no wonder that Clare’s various examples of historical architecture feature prominently in its sign. Located on Nethergate Street, it shows the ruins of the castle, the pink Clare Priory - one of England’s oldest religious houses - St Peter and St Paul’s Church and the intricate timber-framed Ancient House. The central carving featuring the chained swan can also be found on The Swan pub and is thought to have originally been part of Clare Castle. 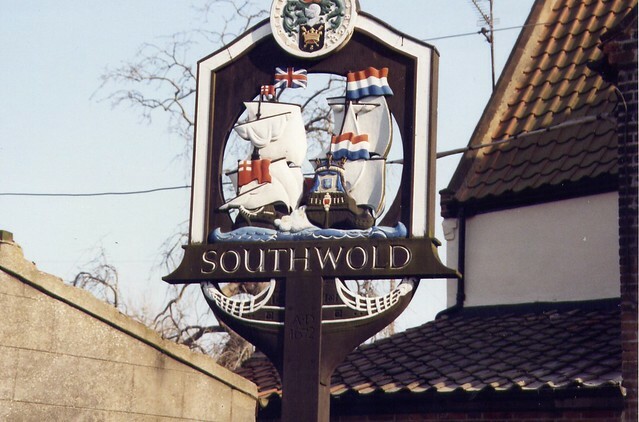 The two ships depicted on this town sign perched on Southwold’s High Street are participants in the Battle of Solebay, the first naval battle of the Third Anglo-Dutch War that ended inconclusively in 1672. A fleet of English and French ships were anchored off Southwold’s coast when they were ambushed by the Dutch fleet on an early June morning. To honour the tercentenary of the battle, local brewery Adnams created the Broadside premium bitter. One of Suffolk’s busier and more colourful village signs, there’s an awful lot going on here for a village that has a population of less than 200 at the last count. Working clockwise from the top left, the pigs represent the area’s pig farming heritage, top right is the eponymous St Andrew’s Church, the black swan down river from the old windmill references the former pub, the parchment is the Treatise on the Laws and Customs of England written by local 12th century statesman Ranulph De Glanville and finally the coat of arms also belongs to De Glanville. 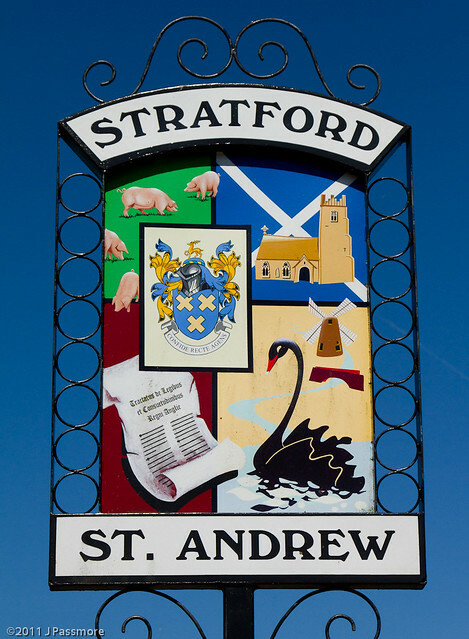 While Stratford St Andrew’s sign crams as much in as possible, the sign belonging to this Waveney town is rather more focused. 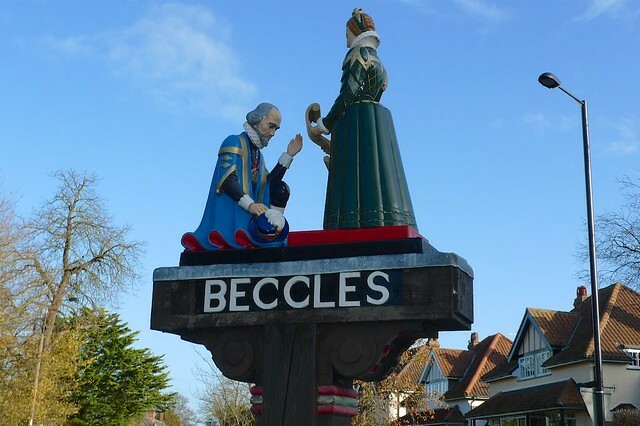 Located at the meeting of Bungay Road and Ballygate, the sign shows the moment that Elizabeth I presented John Bass with Beccles’ Royal Charter in 1584, essentially confirming the settlement’s rights under the Monarchy. 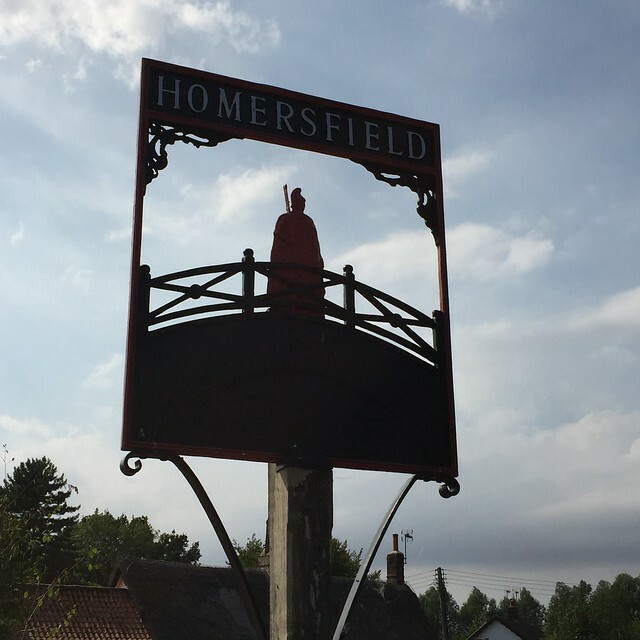 This village on the Norfolk border is another fortunate enough to have two established signs recounting the area’s heritage. The first has a soldier standing on Homersfield’s bridge - said to be the oldest surviving concrete bridge in Britain - while the other was carved out of a cedar tree and is topped by a Neolithic man reaching down below towards carefully carved fish. 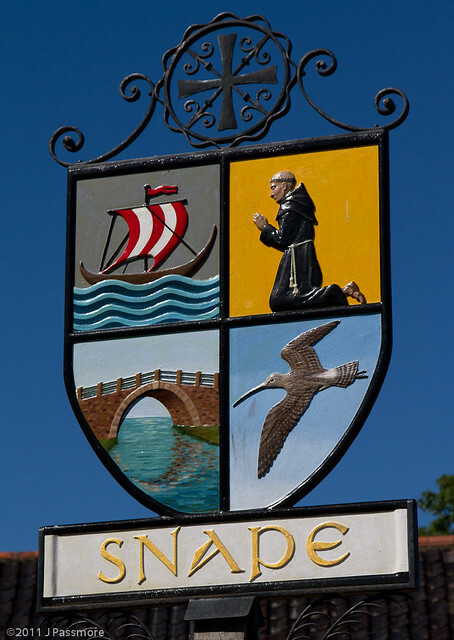 You’d be forgiven for being rather confused by the presence of an anchor and whale bones on the sign of this inland village between Bury St Edmunds and Stowmarket. 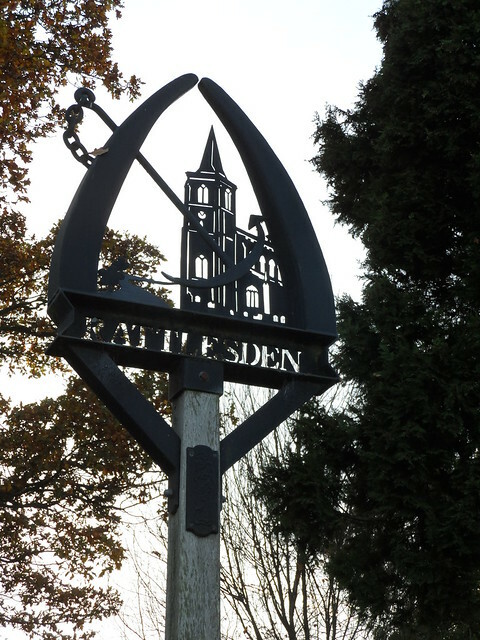 Rattlesden - based on the River Rat - has a long connection with water-based navigation and a door handle on the St Nicholas Church was allegedly made out of an anchor found nearby on the riverbed. The whalebones were arranged in arch over the Rat in the 9th century by a local homeowner although the bones there today are replicas of the original. Nicknamed ‘Little Egypt’ for reasons largely unknown, this small village near Long Melford is home to 48 listed buildings, several of which feature in this sign on a green near Wongs Cherry Tree Chinese restaurant. 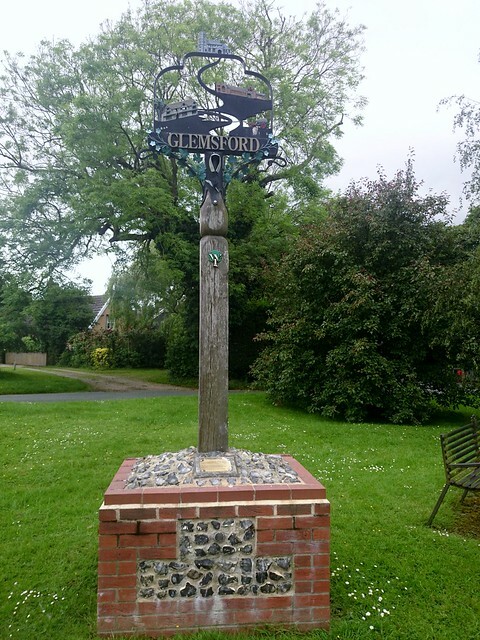 The sign starts with the medieval timbered Monks Hall in the bottom left before working its way past the old Board School building - now Glemsford Primary Academy - and finally reaching the Church of St Mary at the summit.